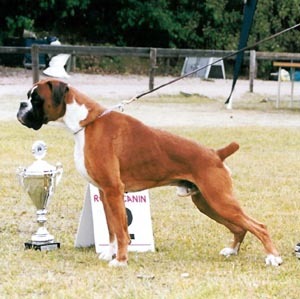 Jerry has been successful in the show ring, both in the UK and abroad. In July 2006 he won his third and crowning CC to become the first Tyberg Champion, he also has two RCC's to his credit and on his visits to Europe he has been graded "Excellent" and placed Third at the Dutch Boxer Club Championship Show. He has also competed at the Atibox World show, where again he was graded "Excellent" and placed 2nd Open Dog in a strong class of 25 males. 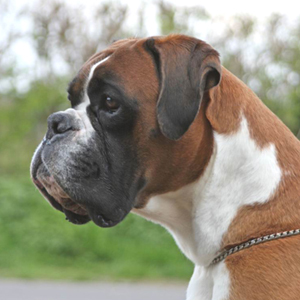 In his pedigree he has the famous Dutch Champion Anouk v Wanda's Home, Champion Bandelero and Plato Van de Hazenberg.